A professional introduction to the end-to-end process of digital filmmaking! The EDCF Guide to Digital Cinema Production sheds light on the ongoing and confusing transition from analog to digital technology in film production. In addition to a complete analysis of technical concerns, this text deals with a number of issues where European and Hollywood priorities differ. It adds fuel to the discussion on "Photo-Chemical Fundamentalism" and the future of traditional film-based cinematography. With special emphasis on new HD production techniques for the big cinema screen, this guide is the one and only resource available from a European perspective. 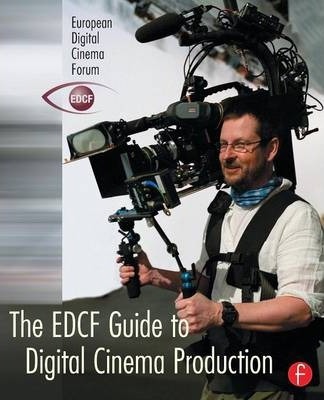 The EDCF Guide to Digital Cinema Production provides film professionals and decisions-makers in European cinema with an excellent basis for discussions on how to handle the transition from analog to digital technology. * Several production case studies, among them Ingmar Bergman's last film "Saraband" (2003) and Lars von Trier's "Dogville" (2003). * Surveys of HD Systems & Cameras and "The 37 MFAQ on HD Production." * Expert reports on Audio Recording for HD and the Digital Intermediate Process. * Detailed European initiatives in Digital Cinema. * An up-to-date survey of the problematic standards situation for Digital Cinema. * A comprehensive look at archiving - the "Achilles Heel" of digital production. * The pros and cons of producing feature films digitally - a unique and professional view of "the agony and ecstacy." Editor-in-Chief Lasse Svanberg is a founding member of EDCF. He was DoP on 14 feature films 1966-81, founded TM (Technolgy & Man) Magazine at the Swedish Film Institute in 1968 and was its Chief Editor until 1998 He was elected Fellow of BKSTS 1979, Fellow of SMPTE 1995 and granted Professor's title by the Swedish Government 2002. He is the author of six books on the history and possible future of film, video and television. The European Digital Digital Cinema Forum (EDCF) was constituted in June 2001 as joint Swedish-British-French effort to establish a European forum for discussions, information exchange and industrial activities in the field of Digital Cinema. This project was initiated because digital production, digital distribution and digital exhibition of film is the most radical technical change facing the film industry since sound film was introduced. Lars has been a Director of Photography for 12 Swedish feature films and one in the US. He is a Fellow of the British Kinematograph Sound and Television Society (BKSTS) and of the Society of Motion Picture and Television Engineers (SMPTE, USA). He is a member of the IBC Council and Board member of European Digital Cinema Forum (EDCF). For 32 years he was head of technology for the Swedish Film Institute.